My grandmother had a friend who used to knit slippers. I think it was the only thing he knew how to knit, and he would knit hundreds of pairs over the course of a year. In different sizes and colors, everybody had a pair of slippers he made. He knit them long and narrow for grandma, short for kids like me, and large pairs for men. The secret is that it was a super simple slipper, knit in the round a bit over halfway, then knit flat the rest of the way in garter stitch. He'd use the tail from knitting the toe to cinch it up into a circle, then the tail from the end to stitch the back seam. All done. Making a pair in crochet that was as easy to adapt has been a plan for a while, and one that I finally did this weekend. Using a bulky yarn, and a size K hook, they stitch up really fast. But you could easily adapt it for worsted or even thread. 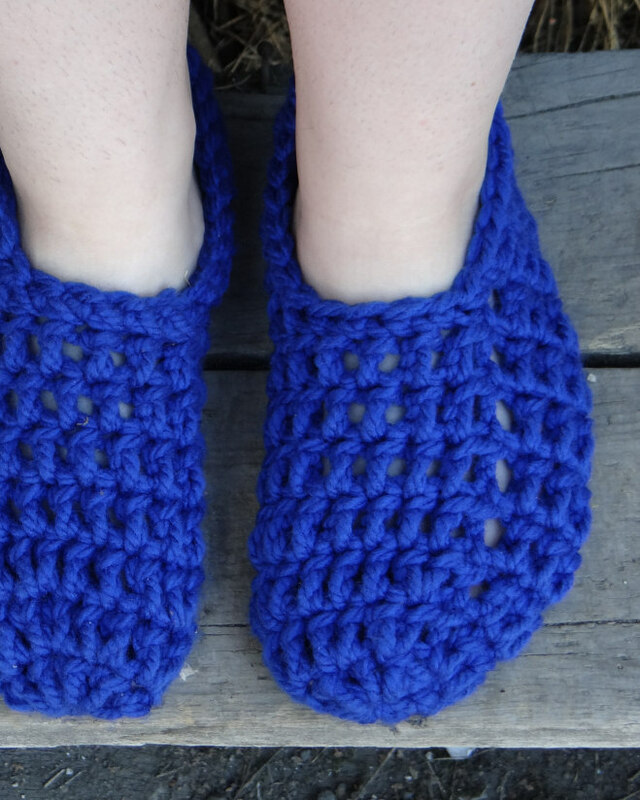 The trick is just getting the toe right, so you may experiment to get the right number of stitches and increases for that, then the rest of the slippers are a breeze. They can also be adapted in other ways. Make the vamp shorter and add a strap for Mary Jane style slippers, or a drawstring or bow for ballet type slippers. So as I work on adaptations for this patterns, I'll post those patterns. But feel free to play with it however you want. The heel on my slippers has some very slight shaping to make it more fitted than the hand knit originals. Overview- Crochet in the round in double crochets, making increases until it fits around your foot, then continue crocheting in the round until it's close to long enough to reach your ankle. Crochet in rows after that for 3/4s (rounded up to an even number of stitches) of the total circumference until it's near to heel length. The heel has some small shaping- so crochet that with doubles, half doubles, singles in the middle, then work out the other way to mirror the first side. Seam the heel. Crochet single crochets in each stitch around. Weave in all ends. repeat ** means repeat what is between the asterisks. Note: on the chain 3 starts for the rows, I do the first chain tight, then the other two chains with normal tension, it seems to be neater for me, but ymmv. So do it however your most comfortable. Break off yarn, and fold heel in half meeting up the mirrored stitches and stitch shut. Knot securely. Edging- join in yarn, sc around the top of the slipper. I worked 2 sc in the bars, and a single crochet in each of the 4 stitches in the middle of the vamp. I gave the finished slippers to The Amazing Turnip Girl. She likes them a lot. I'm going to make myself a pair in pink. A good place to sleep and a giveaway! !